With her repeat clients pushing for the newest yachts with unique amenities, Jana Sheeder, President of 1-800 Yacht Charters, understands the need to keep her finger on the pulse of the latest yachting design trends. Long a design feature in upscale villas and resort suites, the use of balconies (or “terraces”) is the ideal way to integrate interior and exterior areas. This amenity has now caught a foothold in superyacht design. Builders are adding balconies adjacent to interior dining rooms, beach clubs, and most impressively, off of master cabins. 66m ISA motor yacht OKTO, for example, incorporates a private balcony in her full beam master suite. 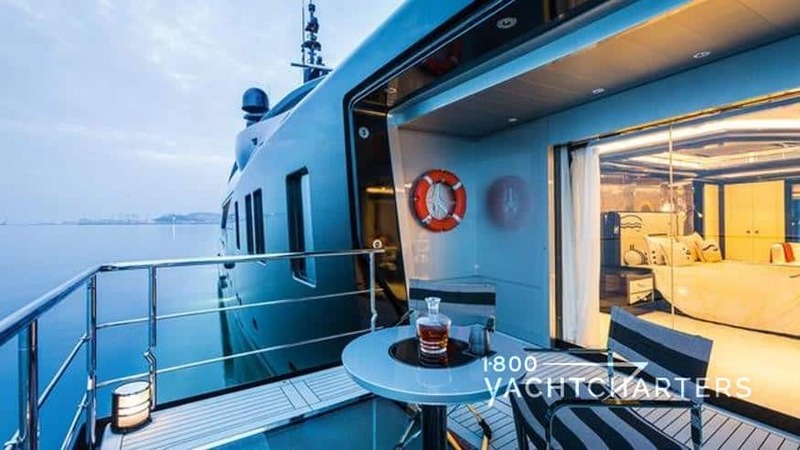 The hydraulic balcony is controlled by the guests at the simple touch of a button (a distinct advantage over earlier generation balconies on older yachts that required the assistance of the crew to open and close). The balcony comes with an air curtain to keep the interior spaces cool, while having the balcony open to the ocean. 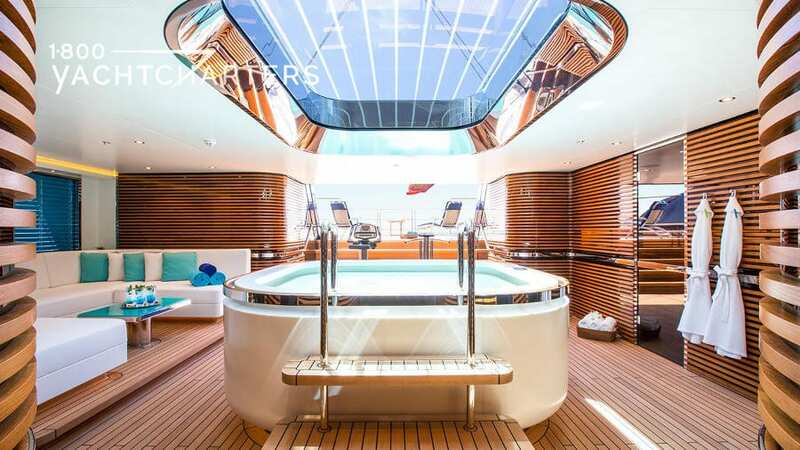 No, not Jacuzzi-style spa tubs – they are still an important superyacht amenity as well. We’re talking about cool, fresh water pools, large enough to frolic with the kids on a warm summer day (or swim in place with the aid of current-generating waterjets). When you’re anchored in a cove near Ibiza on a hot July afternoon, a dip in cool freshwater is a pleasant alternative to the salty, warm ocean. Great examples of Balearic island yacht charter vessels with pools are 67.5m motor yacht ICON, and 108m Pride Mega Yachts 2018 motor yacht TOMORROW. The interest in wellness yacht charter vacations continues to grow, with more and more clients requesting yachts that offer amenities for mind, body, and soul. Saunas, steam rooms, gymnasiums, quiet yoga areas, as well as onboard nutritionists, beauticians, and massage therapists are a big draw. Sheeder believes yachts that cater to mindfulness and overall wellness will be in great demand in 2017 and beyond. Examples are the 85m Lurssen yacht SOLANDGE and Tankoa yacht SUERTE (69m). It’s time to rejuvenate mind, body, and spirit. Let 1-800 Yacht Charters Deliver the Superyacht Experience to you, your family and friends. Call 305-253-7245 or email info@1800yachtcharters.com. 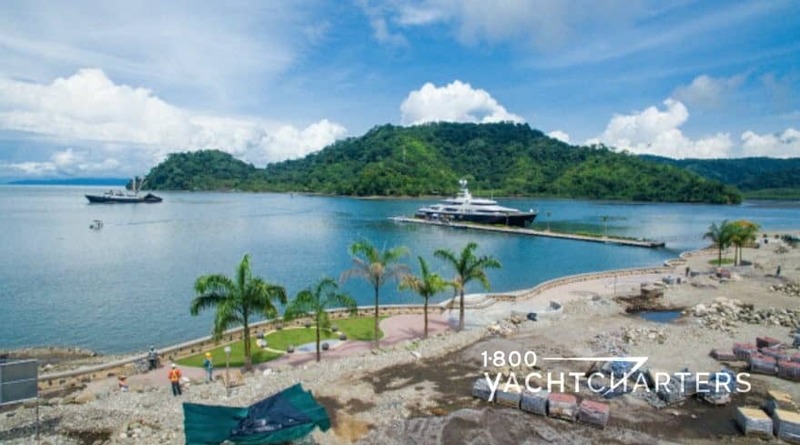 In less than a year, the demand for a marina to accommodate large private luxury yacht charter vessels in Costa Rica will become a reality. Golfito Marina Village, a 40-acre development and marina currently under construction in the ocean-side town of Golfito, Costa Rica, is scheduled for completion in 2017. Much of the main pier has been installed in phase one of construction. In the coming weeks, 52 finger piers will be completed, with berths for yachts in the 13-46 meter range. An additional four 100 meter finger piers will be installed in phase two. For a great selection of yachts for your next vacation, contact 1-800 Yacht Charters at 1-800-922-4824 , 305-253-7245, or use our online contact form here. As the world’s largest yachts continue to grow larger and larger each year, so too do the ideas of superyacht owners as to what features and amenities will make their, “floating villas” stand out from the crowd. This demand for over-the-top luxury pushes high-profile yacht designers to continually “reinvent” the ultimate onboard amenities. No longer is an ondeck Jacuzzi style spa satisfactory. Now, the hot tub must double as a wave-generating swimming pool – with a backlit waterfall cascading over the edge of the spa into a smaller reflection pool. Along a similar innovation path, our company President, Jana Sheeder, recently toured a new build megayacht with designer Evan Marshall. The Marshall-designed yacht features a sundeck with a sunken-floor lounge area that can be flooded with several inches of water, to create a faux beach atmosphere – with the legs of the chaise lounges in the cool water! In prior years, most sundeck bars were intentionally undersized, to make room for the storage of watertoys on deck. 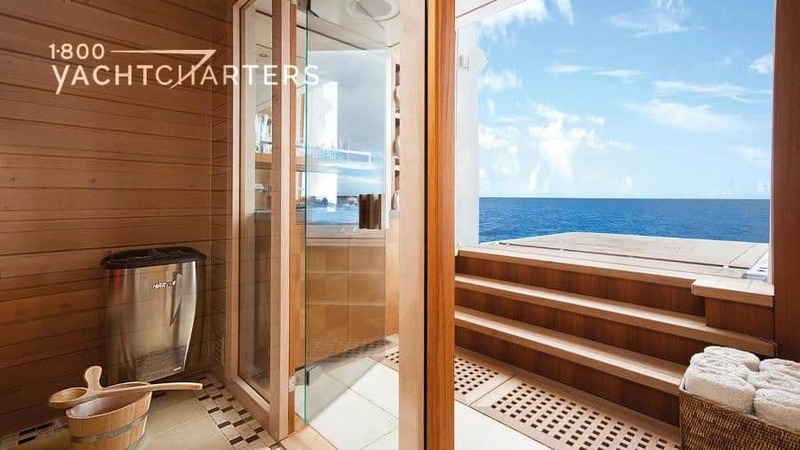 With the advent of more yachts keeping the tenders and toys in garages, the ability to expand ondeck amenities has seen an increase in large outdoor wetbars, built with luxurious stones, polished finishes, and mood lighting. The bars have become focal points ondeck – places where families and friends gather for extended periods to socialize and enjoy the fresh air and seaviews. 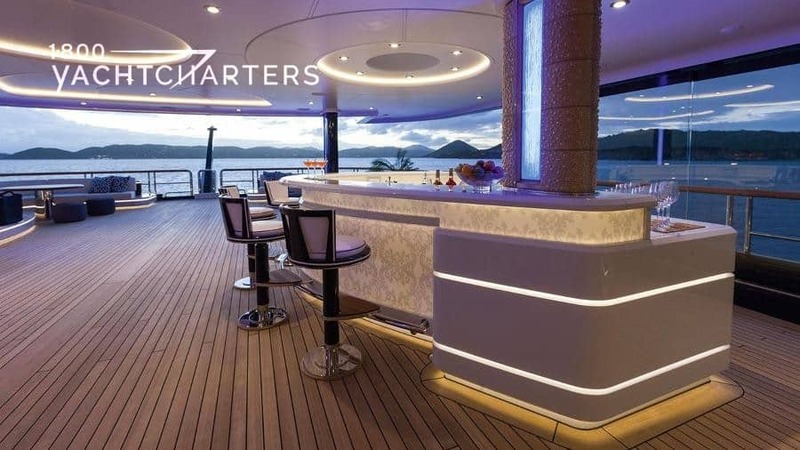 One of the most magnificent outdoor bars is located on the sundeck of Lurssen yacht SOLANDGE. The large curved bar is positioned to the port side and boasts an opaque lighting design that creates a glamorous evening hang-out. This 85 meter Lürssen superyacht was designed by Espen Øeino and has many other notable design features, including a spectacular superyacht fireplace. Interior designers Redman Whiteley Dixon created an amazing wellness area onboard the 63 meter Feadship motor yacht LADY BRITT. The standout room in this area is the Finnish sauna, which opens on to the ocean. Namaste … Charter guests can literally heat up, then take a plunge into the cool ocean. The wellness area features space for massage and hairdressing, and the gym’s panoramic sliding glass doors open to the large spa pool on the sundeck. With more designers relegating tenders and watertoys to side-opening garages on superyachts, prime aft areas that once housed these items are being redesigned with hydraulic balconies and decks to serve as open–air beach clubs. First generation beach clubs were little more than extended swim platforms with tender garages emptied of their contents to make room for a lounge chair or two. Newer designs offer bars, lounges, and spa access points. The best of the new generation clubs serve as all-round waterfront entertaining venues. Your next family adventure is only a mouse-click away. 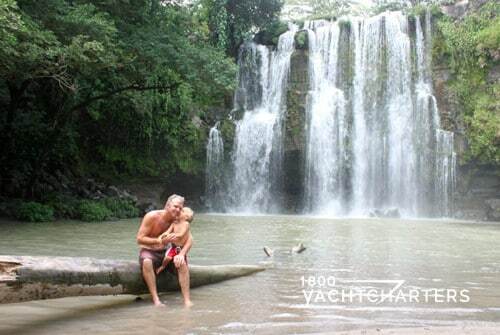 Let 1-800 Yacht Charters, “Deliver the Superyacht Experience” to you and your family onboard a superyacht packed with amazing comforts and amenities. 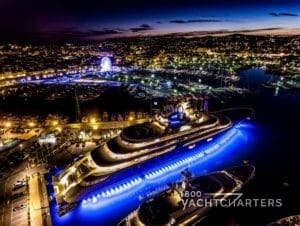 VISIT https://www.1800yachtcharters.com/book-now/ to find the best yacht for your escape. Take advantage of our Best Price Guarantee and 6 star customer service. Wow Girl – World’s Largest GT Yacht DILBAR Is Fine! Every time I lay eyes on Lürssen yacht DILBAR, one word always comes to mind – Wow! There’s just no other way to put it – she’s a biggy. 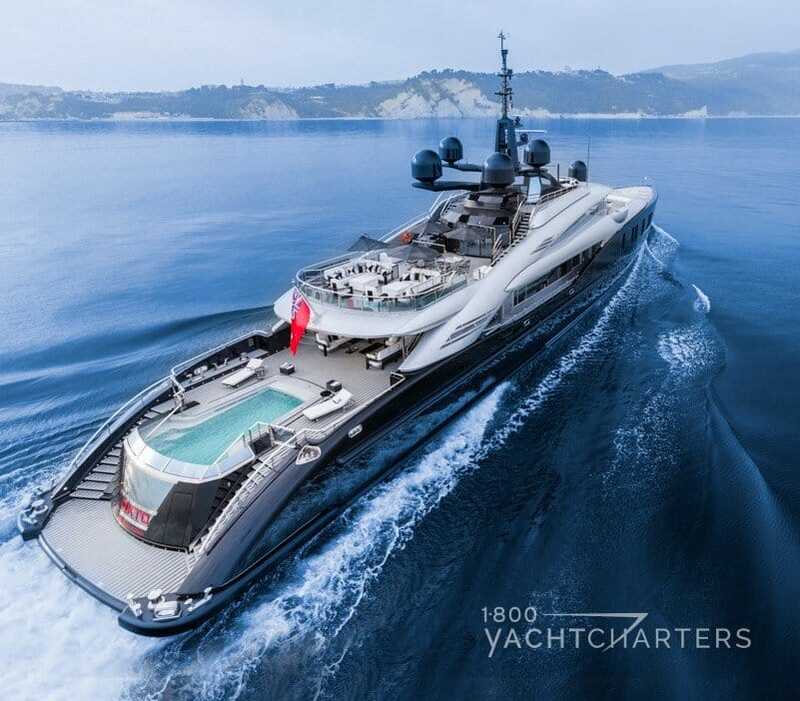 Currently moored in her home berth in Antibes along the French Riviera, the 156 meter superyacht cuts a stunning, massive silhouette at night, backlit by her massive array of underwater blue LED lights. So just how big is big? Well, in terms of length, she’s not the largest – that title currently belongs to another Lurssen, the 180 meter motor yacht AZZAM. Where DILBAR takes the cake is in terms of her volume. In layman’s terms – she’s a brick house, a la Kim Kardashian (sans the incessant, annoying selfies)! In terms of gross tonnage, she’s enormous – 15,917 GT, with dimensions measuring 156 meters in length, a stocky 23 meter beam and drawing an incredible 6 meters below the waterline. Of course, you need all that volume to fit her recordbreaking features, including a 180 cubic meter swimming pool, believed to be the largest on any yacht (certainly larger than on any private luxury yacht charter vessels)…and a 30,000 KW electric diesel power plant, claimed to be the most powerful ever fitted to a superyacht. Here’s a cool fact – the combined length of the cabling on board stretches 1,100 kilometres, over an impressive 3,800 square meter guest spaces! How would you like to be the cable guy who gets called when the cable TV is on the fritz??? Yikes! Turn to 1-800 Yacht Charters to Deliver the Superyacht Experience to you and your family on a Lurssen yacht like the 70 meter motor yacht MARTHA ANN and the 85 meter Lurssen yacht SOLANDGE.